WASHINGTON – Ben Carson admitted Friday that he wasn’t accepted to West Point as he claimed in his book – leading Donald Trump to tweet that was one of “many lies” told by his chief rival. Carson says in his biography, “Gifted Hands,” that he met Gen. William Westmoreland in 1969 at an awards dinner and that led to a “full scholarship” to West Point. He said he turned it down. But there are no records that Carson even applied, Politico reported. “WOW, one of many lies by Ben Carson! Big story,” Trump tweeted. Carson’s camp insists he was told he “could get an appointment,” but decided to pursue medical school instead. Trump earlier unloaded on Carson following reports questioning his narrative about overcoming a violent youth. “With Ben Carson wanting to hit his mother on head with a hammer, stab a friend and Pyramids built for grain storage – don’t people get it?” Trump wrote. Carson responded by saying the intense scrutiny of his childhood was getting ridiculous. “The vetting that you all did with President Obama doesn’t even come close, doesn’t even come close to what you guys are trying to do in my case,” Carson said on CNN. Carson has changed his story about trying to stab a friend when he was 14 – a seminal moment in his biography — now claiming it was actually a close relative and that he changed the name during the telling to protect his privacy. “Carson now admits his friend named ‘Bob,’ who he tried to stab (Bob was saved by his belt buckle! ), no longer exists as Bob. Wrong name!” Trump tweeted. CNN contacted multiple Carson friends, classmates and other contemporaries who were unable to corroborate the violent episodes recounted in the book. It was only last month — when he led all the polls– that Trump said he could see Carson as a possible running-mate. 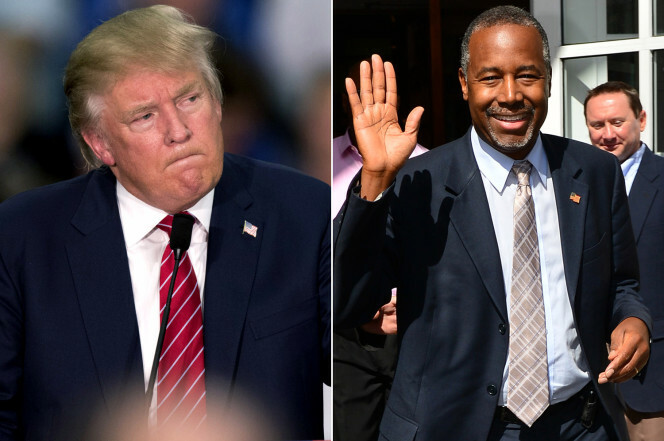 Carson just surpassed Trump – by 0.2 percentage points – in the Real Clear Politics average.